Can we talk about the miracle of flax eggs? You might not be able to whip them into an omelet or use them in a quiche, but I’ve been experimenting with them a lot in vegan baking lately and they work really well. Better than I expected, even. I rarely have eggs on hand because we just don’t eat them very often, so now when I bake something, I usually make it vegan by substituting ground flax and water for the eggs, almond or coconut milk for the dairy milk, and coconut oil for the butter. Unlike traditional baking ingredients, which I’d have to add to my shopping list, these are all things that I always have on hand nearly all the time, which I guess might be a bad thing because the fact that I have these things on hand all the time is encouraging me to bake more. So how does flax work as an egg substitute? It’s magic! Okay, I’m lying, it’s not magic. I don’t really know exactly how it works. But when you whisk ground flax seeds with water and let the mixture sit for a few minutes, it gels up and feels a little bit eggy. It’s not quite as strong when it comes to binding ingredients together, and it can’t be substituted for eggs in every recipe (like the aforementioned omelets), but it’s a nice, natural way to replace eggs in a lot of different dishes. Having tackled using flax eggs in baking, I wanted to see how they would work to bind panko to baked eggplant fries. I was worried it would be a massive failure, but overjoyed when it actually worked. It worked! And it worked well! These vegan Panko-Crusted Baked Eggplant Fries are crispy and delicious on the outside and tender on the inside. I used baby eggplant because I find smaller eggplants to be less bitter, so I can cut out the step of salting them. Older eggplant can be bitter too, so buy local if you can because it’s spent less time traveling to your grocery store. 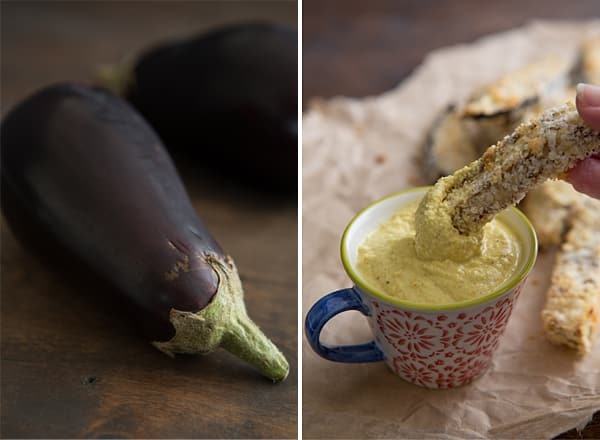 It would be a travesty to serve delicious, crispy eggplant fries without a sauce, so I whipped up a Curried Cashew Aioli for dipping. It’s kind of the same idea of my Cashew Mayo recipe, except with a heaping teaspoon of sweet curry powder added to it. If you don’t want to bother with the dipping sauce, jarred marinara sauce works too. Crispy vegan baked eggplant fries served with Curried Cashew Aioli. Preheat oven to 400ºF. Spray a large baking sheet with oil or cooking spray. Whisk together the warm water and flax seeds in a shallow bowl; set aside. Stir a healthy pinch of salt and cayenne into the flax mixture. 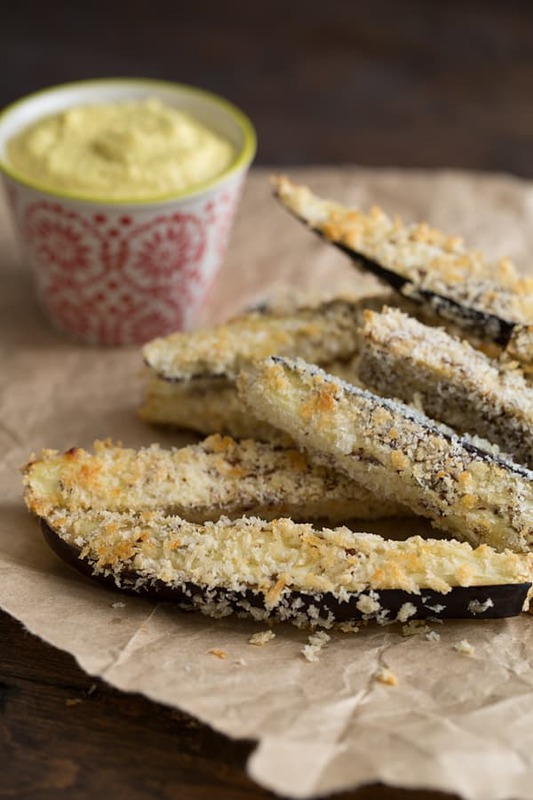 Place the panko crumbs on a plate, then roll each eggplant fry in the flax mixture, followed by the panko crumbs. Transfer the finished fries to the prepared baking sheet and spray the tops with additional oil. Bake for about 25 minutes, or until the fries are tender and golden brown on the outside. Serve with Curried Cashew Aioli. Place the cashews, water, lemon juice, garlic, and curry powder in a food processor or blender. Process until smooth, then season to taste with salt and pepper. I don’t like wasting breadcrumbs, so one cup of panko is the exact amount I used for this recipe–you might need a little bit more, depending on the size of your eggplant. If the flax mixture dries up, add another tablespoon of warm water, give it a good whisking, and let it sit for a minute or two until it gels up again. Eggplant is my favorite vegetable and am constantly looking for new ways of cooking it. This looks absolutely delicious!!! Not many people say eggplant is their favorite vegetable! 🙂 I really like it too–it’s definitely under-rated! These look delicious. I’m going to have to sub the breading but at least I won’t have to share, lol. The hubs is as anti-eggplant as they get (unless it’s Baba Ganoush). I saw some GF pinners mention subbing almond flour or coconut flakes. I know almond flour wouldn’t work for you, but maybe coconut flakes? Great recipe! Im going to do at the year’s end party! Gotta love eggplants! This is so helpful to know! 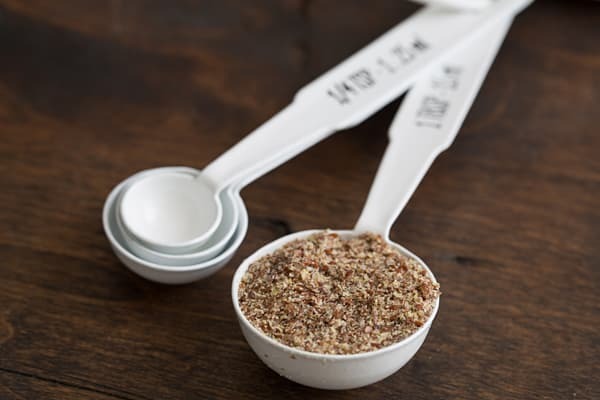 I’ve wondered about vegan substitutes for things like zucchini fries or other breaded veggies…I tried almond milk with breadcrumbs once and it didn’t work very well, so now that I know flax works, I’ll have to try that next time! I like the idea of pairing these fries with a curried cashew dip too for something different! Ooh, Japanese eggplant would be perfect for fries! While I’ve got the eggplant out for my sandwich, I might as well make these too! Mmm! Thanks for sharing! Sounds delicious! Can’t wait to try these. I really, really wish you would include nutritional info with the recipes. I can rarely cook things for my family without the nutritional info due to health issues. Oh yes! I just made these tonight from my farmer’s market haul over the weekend that included a big, beautiful eggplant. I needed to use more flax covering and panko (to which I added crushed cereal). These were beyond delicious and the aioli is perfect! Wish I could include my own photos. Thank you for your amazing recipes. these came out fantastic and were so easy to make! the recipe was also very simple compared to many others i found, adding to the likelihood that these will become a staple in my kitchen. thank you!